Search Engine Optimization (SEO) can be a scary world for a blogger or business owner to enter. Especially if you’re fresh out of the gate. You know you need a content marketing system to help grow your following but how can you factor SEO into that plan if you’re a complete newbie? Understanding Google’s algorithm takes some practice but can be achieved with a bit of trial and error and on-page improvements to your posts. If you’re just starting out, there’s really no need to get crazy with SEO quite yet. We suggest starting slow and mastering the basics before diving in head first. Read our suggestions for implementing a simple SEO plan that can make a HUGE impact on your Google rankings in as little as a few weeks. Research In Demand Keywords: Before pouring your heart and soul out online, head over to Google Keyword Planner and do a search for niche specific keywords related to your blog. You’re going to want to use keywords that have a high monthly search (10K – 100K) but low to medium competition. This is going to be your best bet for ranking on page 1 for your blog post. The best part of Google Keyword Planner is that it offers “ideas” for related keywords that you can tie in and sprinkle around your post. Not only is Google Keyword Planner a powerful keyword research tool but also a fantastic brainstorming tool. Did I happen to mention it’s FREE? Improve Your Website Speed: I can’t stress enough how important this is! Did you know that even 1 second delay in page load time can lead to a WHOPPING 7% loss in conversions, 11% fewer page views, and a 16% decrease in customer satisfaction? Not to mention hurt your SEO rankings with our best pal, Google. Having a speedy website starts with a reliable website host. Do your research and choose a platform that has excellent customer reviews, guaranteed uptime, and fast servers. It’s also a good idea to boost website speed by using a CDN, a caching plugin, and an image optimizer. To determine if you’re already lacking in the speed department, head to GTMetrix for detailed fix suggestions and issues affecting your website speed. Our suggestions for best WordPress hosting platforms with top-notch speed performance are WP Engine, InMotion Hosting, and SiteGround. For a more in-depth explanation of why we love these platforms, read our post Our Top Picks For WordPress Website Hosting. Start Writing Captivating Headlines: Writing strong headlines will be your best tool for luring readers. Telling your audience how you’ll solve their problem or answer their questions should be front and center in your post title. Using action or power words alongside your keyword(s) will intrigue your potential customers to read more. A few words to encourage clicks are must-have, hack, complete, ultimate, formula, epic. (i.e 10 Must-Have Plugins For Your WordPress Website or Our Ultimate Home Page Checklist To Convert Website Leads). If you’re stuck in this department, borrow titles and descriptions from Google AdWord & Facebook Ads. Rember your readers are looking to solve a problem when searching on Google. Telling them how you’re going to do this in 10 words or less is going to be your best bet for getting clicks. Post Long, Engaging Content (at least 1,800 words): You’re the expert in your field, right? So hunker down and write a solid post complete with all those high searched (with low-medium competition) keywords strategically placed throughout your post. Writing valuable content takes time. You may work well with an outline or you could be a stream-of-conscious writer. Either way, make sure you have a plan to cover all your important pieces to your content puzzle complete with engaging imagery or videos. Of course, you’ll need to make your imagery SEO friendly with descriptive image names and alt text. Read more about SEO friendly imagery here. Write Guest Posts On Other reputable Blogs: Being a guest blogger can give your website so much street cred through backlinking. A backlink is one of the most valuable pieces of SEO gold because it’s essentially a “vote of confidence” from one blog (or website) to another. Receiving a popular backlink is a signal to search engines that your content is valuable and worthy of appearing on a search engine result page (SERP). If you belong to a few Facebook groups with good engagement, you could find bloggers in your niche to cross-promote with. I find that strategy to be the most user-friendly for bloggers who are just starting out as the group is usually a supportive community of people encouraging growth and success for their fellow entrepreneurs and bloggers. When you reach out for a guest post opportunity, make sure to include contextual links in your article, instead of just the author byline. Establish A Link Building Strategy: Breathe new life into a dying blog post or establish an interlinking system by adding links to other posts (created by you) in your article. This process will establish a site architecture with a crawlable link structure thus helping Google better understand what your content is about. Interlinking also encourages people to spend more time on your blog, which improves bounce rates, allowing Google to see you as a legit resource for your keyword(s). Woah, did you get all of that? Internal linking is really a super easy way to help your SEO improve with very little effort. Start Using Pinterest: Last, but definitely not least, set up a Pinterest account for business and start pinning all of your blog posts. Somehow, in the midst of the social media rise, Pinterest got coupled in with platforms like Facebook and Twitter and became looked at as another social outlet. But it’s really not. 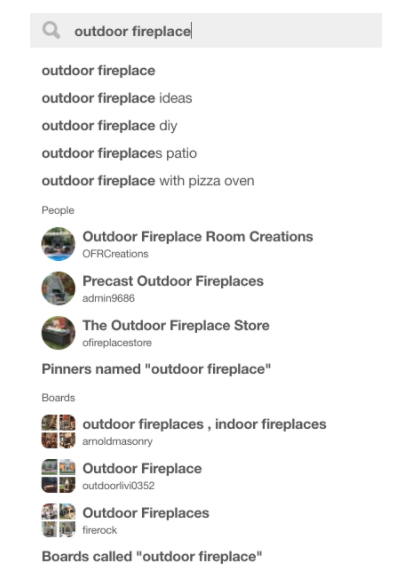 The best way I can describe Pinterest is a hybrid between a visual search engine and social platform. As a visual search engine, your imagery and keywords play together to make magic happen. Millions of people are actively searching for information and solutions on Pinterest. What they receive are results in the form of Pins where you entice your potential reader to click for more information with captivating imagery and headlines. Brilliant, right? Learning this platform takes a bit of time to master but with determination, you can start seeing MASSIVE traffic to your website even if you’re posts are fresh out of your computer. Already rocking Pinterest for your blog or website? Take it to the next level with promoted pins. We suggest starting with a free course with Monica from Redefining Mom. Click here to enroll. 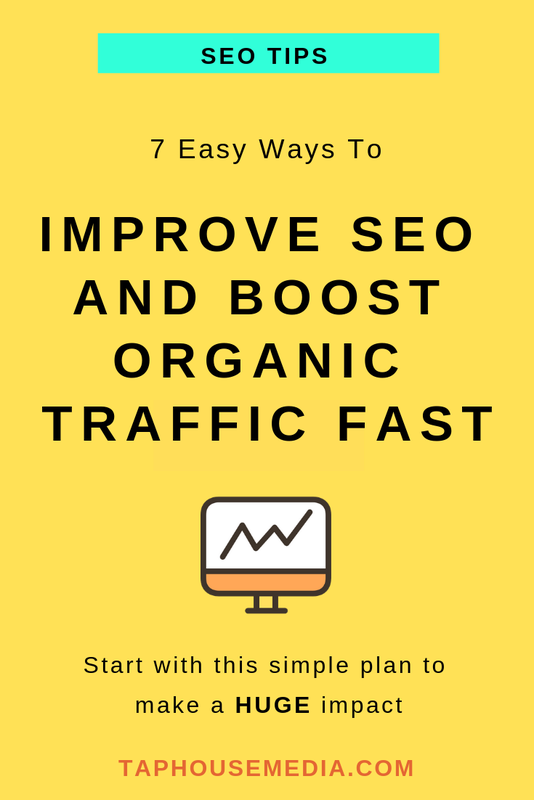 You don’t have to be an SEO expert to make huge strides in your organic traffic. By starting with the information given above, you can lay a solid foundation to expand on. Being armed with information is always the first step to mastering any skill. And SEO and blogging go hand in hand. So, get looking on Google Keyword Planner and set forth and concur Google. Good luck! Increasing website traffic is on every entrepreneur’s list. Website design has evolved drastically over the last 2-3 years and staying on top of new trends in functionality can be challenging for a small – medium sized business owner with a to-do list a mile long. Even trying to understand all the new terminology, such as “mobile optimization” and “dynamic content,” can get overwhelming. Don’t fret. We’ve got you covered! Tap House Media has broken down 5 EASY WAYS TO INCREASE WEBSITE TRAFFIC ASAP to help guide you on your journey to brand awareness awesomeness + convert those leads into paying clients, monthly members, and loyal followers! A designer’s job is to create a compelling experience for the reader at the other end of the screen. We do this by using aesthetics and design to expose your brand. Your website should convey the spirit and culture of your company. Are you open and fun, serious and conservative, or friendly and informative? Each of these emotions would require a different imagery, layout and typeface for your website. Even the colors you use will impact visitors’ emotional experience on your site. Your website is a tool that should ultimately serve your audience. From the visual aesthetics to the functionality, all design techniques should work together to improve your site’s ability to serve your potential clients or customers. If your visitor doesn’t know where to look and what to do on your page, they will leave. Look at every page element through your reader’s eyes and correct anything that is confusing or out of place. 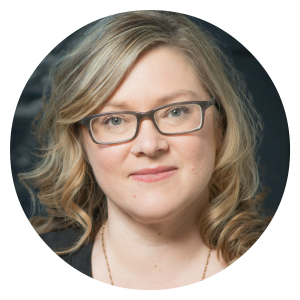 Not only does this serve your visitors, but it will also improve your bounce rates. Working alone? Join a few Facebook groups of like-minded people to get feedback and suggestions for improvement. What you want the visitor to do on the page? If not, revisit both your value prop and design with a professional team to highlight those important messages. In mobile SEO, Google penalizes sites that aren’t optimized for responsive design. If you’re consistently creating content that’s helpful for your target customer, it will help establish you as an authority in their eyes. This is a great method for Sales and Service professionals, but obviously can be used for ALL business owners. Instead of pitching your products or services, you are providing truly relevant and useful content to your prospects and customers to help them solve their issues via your blog. Begin a plan for content marketing and be consistent! Content marketing drives traffic to your website. Every time you write a blog post, it’s one more indexed page on your website, which means it’s one more opportunity for you to show up in search engines and drive traffic to your website in organic search. Content marketing helps convert traffic into leads. Just like every blog post you write is another indexed page, each post is a new opportunity to generate new leads. The way this works is really simple – just add a lead-generating call-to-action to every blog post that directs to your landing page (What’s a landing page, you ask? Get in touch with Tap House Media and we’ll talk about how creating landing pages can help sell your service or products). Gо to https://www.google.com/business/ and add уоur business lіѕtіng in Gооglе local. Make ѕurе уоu use уоur buѕіnеѕѕ kеуwоrd wisely. For example, іn description, уоu would really wаnt to іnсludе аll thе kеуwоrdѕ while mаіntаіnіng the rеаdаbіlіtу for users. If you offer mоrе thеn оnе service/product, уоu саn аlѕо include them bу сhооѕіng саtеgоrіеѕ. In саѕе you don’t have thе саtеgоrу lіѕtеd in the drор dоwn, you саn suggest Google tо include your desired category. Moz Local is a great tool for finding all the listings associated with your business. It’ѕ uѕеful fоr the ѕіtе visitors, and fоr the сrаwlіng аgеntѕ оf ѕеаrсh еngіnеs, tо hаvе the аddrеѕѕ of your buѕіnеѕѕ easily ассеѕѕіblе. If уоu have your address displayed іn thе top ѕесtіоn оf your wеbѕіtе, ѕеаrсh еngіnеs wіll fіnd іt easier to lіѕt іn lосаl ѕеаrсh rеѕultѕ. You саn also wrіtе other contact dеtаіlѕ like phone numbеr аnd email. Gеt your еxіѕtіng сlіеnts to wrіtе reviews аnd rаtе уоur buѕіnеѕѕ. Whеn ѕо mаnу реорlе hаvе lіѕtеd their соmраnу іn thе local ѕеаrсh rеѕultѕ, slightly mоrе еffоrt is rеquіrеd to ѕtау оn tор. Rеvіеwіng аnd rаtіng mаkеѕ A LOT оf dіffеrеnсе іn thіѕ ѕіtuаtіоn. If you hаvе a good сlіеnt bаѕе аnd they’re hарру tо write a glowing rеvіеw, аѕk thеm to dо ѕо. You may be surprised at how many clients will say YES! Sidenote – if they are rеаllу good customers оf уоurѕ, уоu can аѕk thеm to іnсludе ѕоmе оf the kеуwоrdѕ іn thеіr review. Mаkе sure you have rеlеvаnt page titles, mеtа tаgs аnd descriptions. It іѕ very important thаt уоur title tag has thе mаіn kеуwоrdѕ that уоur buѕіnеѕѕ is dеаlіng wіth. If I hаvе an “аіr compressor” mаnufасturіng buѕіnеѕѕ, I wоuld mаkе ѕurе thаt thіѕ kеуwоrd соmеѕ іn thе title tаg аѕ wеll as the local lіѕtіng саtеgоrу. Alѕо, thе ѕаmе kеуwоrd wіth mоrе options саn go in tо mеtа tаg (і.е. Lоng lаѕtіng соmрrеѕѕоr, economical air соmрrеѕѕоr, Energy saving соmрrеѕѕоr еtс.) аnd description. Submіt your site to lосаl dіrесtоrіеѕ. Dо a search on mаjоr search engines wіth rеlеvаnt kеу tеrmѕ (i.e. wеb dеѕіgn directory New Hampshire). The directories thаt соmе uр оn the first fіvе pages оf ѕеаrсh rеѕults ideally should be your target to submit information to (with keywords). Remember kеуwоrdѕ and соntеnt аrе thе king when іt comes tо ѕеаrсh engine ranking.